When you go to a vegan fair, take my advice, arrive hungry. I mean skip breakfast and get down there with a proper appetite. If you don’t, you may regret it. 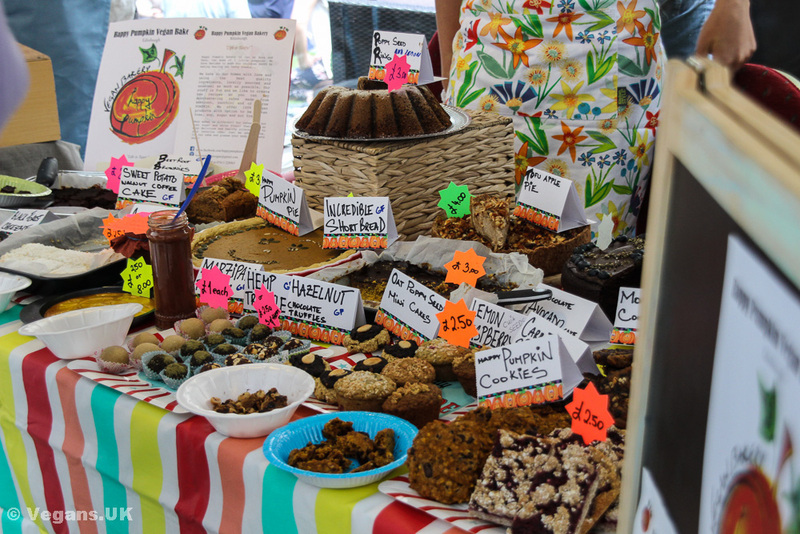 There’s so much more to a vegan fair besides food of course (what do you mean, ‘is there?’) but there’s nothing quite as frustrating as that feeling of being too full to try that pie, that donut, that sizzling burger. So, do yourself a favour and make sure you at least get a decent run at it. As I entered the Corn Exchange in Edinburgh on a sunny October day, it was a great prospect to look at all the stalls and know that every single one of them was not only vegan friendly, but TOTALLY vegan. Oh, bliss. I mean, in this non-vegan world it’s a fabulous novelty. I’ve done reviews of vegan fairs before, so if you’ve read them you’ll roughly know the drill. There are loads of stalls – from charities, to cupcakes, from beauty products to t-shirts and jewellery. This particular fair was in aid of Farplace Animal Rescue, a no-kill shelter located in County Durham who campaign for the rights of animals. I bought one of their anti-badger cull t-shirts and spoke to some of their volunteers. They’re running a campaign at the moment to try and raise some money, see here for details. They also re-home animals, from rabbits to pigs! One of the first stalls I stopped at was a charity called Pounds for Poundies who raise money in order to help rescue charities save more dogs from an uncertain future in the pound. Another t-shirt was purchased and they told me about their current campaign which aims to get people to consider re-homing a staffie, as there are so many in pounds at the moment. I was pleased to finally meet the faces behind Humblestuff, the makers of environmentally friendly, vegan cleaning products. The fizzing sticks that are used to clean toilet bowls can also be used as a bath bomb! I’m pretty sure it’s the only loo cleaner that can make that claim! I’m constantly amazed by the wonderful quality of modern vegan cheese. Both Tyne Chease and Nutcrafter Creamery were there, with some fabulous examples. They had firm cheeses, cream cheeses and even vegan butter. Gone are the days when an excuse not to go vegan was ‘I’d miss cheese’ thanks to companies like these. Bute Island Foods was also doing tastings and their range just keeps expanding. They’re the ones responsible for Sainsbury’s new hit vegan cheese (or ‘Gary’ as it’s been christened by the internet…) It does me good to see products like this filtering through to the mainstream. All this is to say nothing of the cake! I was so encouraged to see many local bakers there with stands. The interest in vegan cakes is always high and bakers have nothing to lose by catering for us. Believe me, I don’t know any non-vegans that would turn their noses up at these delectable offerings. I could go on and on, but let’s just say I spent most of the day here and was not even slightly bored. It was a lot busier than many expected it to be and I’m so glad it was a success. As more and more people turn to veganism, I can only see these events getting bigger and better, and that is a very happy thought. You can even get dog toiletries here! Hunt Sabs, doing it for the animals.